They jumped into history with no name. 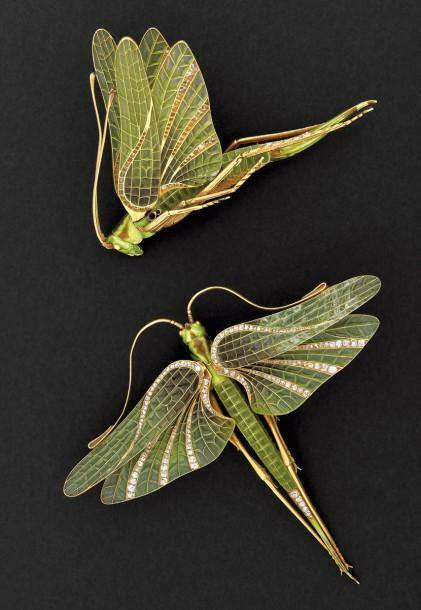 The auction curators at Drouot had no idea who made these realistic plique-a-jour enamel locusts with diamond lines, set in gold, so they estimated their value at 6500 euros. 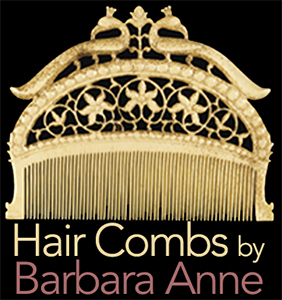 In the description, Drouot wondered if the locusts were destined to adorn a hairstyle or ornament a corsage. Even though jewelry was made with different fittings in 1900, I think these are hair ornaments. What stands out is the estimate, which highlights how much provenance is worth in the art world. 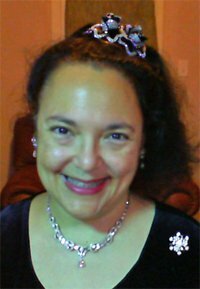 Anyone could see these pieces were made by one of the master-jewelers of French Art Nouveau, and so bidders appropriately valued them at 141,000 euros. Here is my guess as to who made them, and why they might have been unsigned. Lucien Gaillard employed Japanese craftsmen in his workshop. 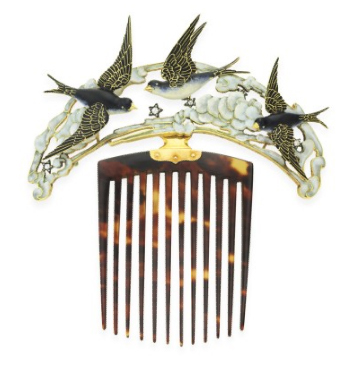 One of them created the Blue Bird Comb, which sold for $218,500 on October 21, 2009. Gaillard didn’t make it, he just signed it. The craftsman who did make it observed the arch of birds’ bodies as they dove in flight and made each bird a slightly different size. It was mastery of the Realism seen in Meiji kanazashi ornaments, not French Symbolism, which would elongate part of an object to make a philosophical point. To me, these locusts look like those blue birds. They are exactly proportioned. The inlay and enamel work matches. I think they were made by the same Japanese craftsman in Gaillard’s workshop who made the Blue Bird comb. However, this time, Gaillard did not dare sign his employee’s work. The maker himself was not prominent enough to sign them, and so the author remains unknown. For more scholarly research, please examine the books Christie’s uses, which have been added to our Resource Library. They are both by Alastair Duncan.